The National published an interesting article about Middle Easten culture inspiring mainstream Western fashion, including the hijab and abaya. Watch out for extensive coverage of Autumn 2009 designer collections coming soon! Middle Eastern-inspired fashion is currently en vogue around the world from the streets to the catwalks. But rather than merely dabbling in aesthetic exoticism, the designers and brands who are exploring the region’s sartorial traditions are drawing inspiration from a commercial viability that’s given the style such sturdy legs. Kaffiyehs were an integral part of the Eighties bohemian look worn by American girls. They caught on with Japanese teenagers in the early part of the decade, but by the mid-2000s, however, hipsters from the gritty sections of Brooklyn to the hallowed halls of New York’s universities were again seen sporting the traditional Arab attire as scarves around their necks, making a statement purely for the sake of style. Soon, they were available at H&M, Topshop and Urban Outfitters, while Nicolas Ghesquière for Balenciaga adorned them with charming pendants in his collegiate and tribal-inspired autumn/winter 2007 collection. To complete the scholastic-inspired outfits, Ghesquière also paraded them along with jodhpur pants, which were showed in various iterations at numerous shows, including Roberto Cavalli, Vivienne Westwood and Dries Van Noten. 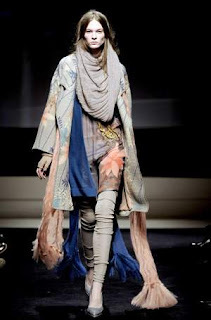 Masha Allah, so dramatic and beautiful..."desert-wear goes-runway"